FOR WATER LEVEL MEASUREMENT CAN BE MEASURED WITHOUT EARTHED LINE CONSIDERABLE TIME SAVINGS WHEN MEASURING WATER LEVEL. 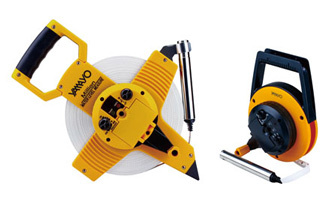 You can measure without earthed line. You can select water quality as sensitivity is adjustable against various kinds of water. You can judge the breaking of wire with the test function. 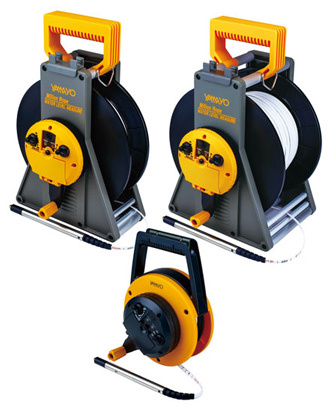 PVC coated fiberglass tape combined with probe. #Battery life:approx in 24 hours consecutive use. Narrow and thick material of tape is head to stick inside the pipe. Probe has only 12mm of diameter so very suitable for the thin pipe. 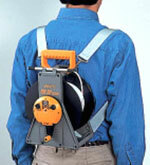 @You can use optionally supplied belts on your back for easy moving. Do not use against petroleum and any inflammable liquid. Wire inside the tape might be cut by violent use. Especially, be careful to handle near the probe. It's not suitable for any inflammable or non-conductive liquid. Use alcoholics is prohibited to avoid for use against liquid containing alkali, surface active agent and salt. Shocking or sinking the body is prohibited. Leaving under high temperature exposing to the direct rays of the sun for a long time is prohibited. Remove the batteries when you do not use for a long time. Disassembly of handle or case is prohibited.